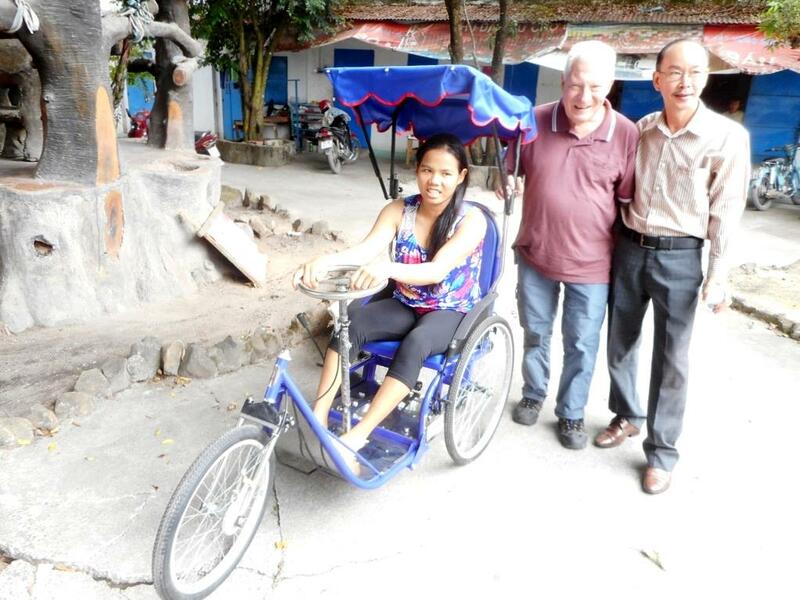 Pictured above is our member Michael Redding in Ho Chi Minh City with Anh Nguyen, a Board member of the NTCM Charity, who were presenting the second of four tricycle wheelchairs to Loan who has cerebral palsy. Funding for the construction of the wheelchairs was supplied by Werribee Rotary. Loan is 23 years old and lives in Vung Tau. She is unmarried and has a 3-year old son. He is looked after by her grandmother who lives quite some distance away. Loan earns an income by selling lottery tickets each day on a commission basis. The wheelchair will enable her to have increased mobility and therefore to earn more money. Loan is able to send money to her grandmother to support her son.